The points here mainly apply to building mobile applications for Android using Java as the programming language. I’ll be talking about APIs that return structured JSON data. Even if you’re very good with what you do, using a framework will greatly reduce the effort needed to finish the API (your business not mine) and more importantly to make your API responses more consistent with each other. Since you’re not using a framework or even a model then you might return same values with different keys, and whenever you need to modify the key you’ll end up searching all of your scripts for that key and you’ll probably forget to change some. For the responses above to work we have to check for both id and user_id which is ugly and unnecessary. Think about the future of the API you’re writing and try not to get the next developer (or future you) to curse each line of code. Why? to re-use the same User parsing code. In case you’ve written very few APIs then I encourage you to see how other public APIs work and how they are organized. You can learn alot from Google, Facebook or any other APIs. As for a good framework, in case you’re writing PHP then you might want to check Laravel. Whether it’s a string or an integer, you should always return a status code of some sort. Otherwise the API client will not be able to know if the request was successfully executed on the server or not. Whether you decide to return the status code inside the JSON body or response header always try to keep the number of status codes to minimum, sit with the app developer and agree on the status codes needed and what each one means. Keep in mind that the app developer is probably using a central method that pre-processes ALL responses, a method that “peels” the response and gets top level information like status codes, errors and probably even the JSON data object returned within the response. Try to return error messages using a specific constant key in the JSON response. Don’t return an error if I request page 999 and you only have data up to page 5, instead return an empty JSON array. If you return an error then the app will probably think the request is malformed or invalid. Let ME handle reaching end of the results on my own. Maybe I don’t want to display a dialog or toast (Yaaaay you know Android). If you can include pagination information with the response (current page, total pages) that would be great. but If you can’t then just return an empty array. If the app developer asks you to modify something in the API or add specific flags please do it and don’t waste time on asking him why or teaching him how to do his job. Unless what he’s asking is a total nonsense then please just do it. One of the worst things to do is to tell the app developer how to implement something in order for the app to be compatible with your API. Don’t tell me to just use an AsyncTask for this request or that, I’m not even using AsyncTasks (directly at least) to fire API requests. I have my own structure, I use well known libraries and it’s not a solution to build a networking solution just for that case that can be easily fixed from your side. Back to JSON responses, if an object is null then don’t send it at all! especially strings. Without the app developer implementing a workaround then the string will be parsed as a “null” literal, so just don’t send it. No photos available on server so I received false instead!! The first response is totally fine, I expect an array and a JSON array is returned. The second one however returns false instead of an empty array (I have no idea why). We also prefer supplying true/false as request parameters instead of 1 or 0. Spitting your query result into a JSON object will include many un-needed values and sometimes values that shouldn’t be accessible to the client. We might accept the weird names you chose for your table columns but unneeded fields are still unneeded. Do some processing and return a well formatted response instead. Make it developer friendly. Apps usually store a cached version of profiles and whenever an edit is made the app needs to get the most recent version to store it locally. Another example of useless responses is not returning the FULL created object when calling an API that creates stuff like bookings, comments or any other thing that the app will most likely need to display after the request is complete. If I post a comment or send a chat message then you better send it back to me with all the fields included. Let’s say you’re making a social network app and each user can be either private or public and your social network enables users to follow each other. public_followed, public_not_followed, private_followed and private_not_followed. If the software solution involves user registration and login then you’ll need something to be sent by the client app with each request to know the sender’s identity and return the data accessible to that user. I’ve seen some people implementing this by expecting the client (app) to send the user id with each request. What they are doing here is very wrong as they’re fully trusting the client to only send the right id and not try sending an id for a different user. So just get the id of the user and you have full access to his data! And the requests doesn’t have to come from the app itself. It can be from any API client. Don’t ask to get hacked. Consider generating an access token (look it up if you’ve never heard of it) for each user login. The client needs to send this user specific access token with all requests. So this is related to the previous point. If you want to link each user to a Facebook account then the client app should do the Facebook authentication and get an access token (Ahha!) then send this token to your server. Your server can then query Facebook Graph Api to make sure that this Facebook token is valid and get the user data. I saw a case where the Facebook user registration API expects a Facebook user id and not a Facebook token. In this case I can get the Facebook id of any user and login using that id to access his information. Your server will contact Facebook servers to check the validity of the provided Facebook token. You can request user profile for example. If token is valid then Facebook returns the user details including id, name and other fields depending on permissions. The client application can now use this token you created to make authenticated requests. Postman is one of many good API clients that can build and test API requests. Use it while you’re building your APIs, it can save collections of APIs with their parameters. This can become a good reference for you and the app developer and it can also serve as an API documentation with instant requests tests. The point here is to make URLs more organized and group-able. Removing the ugly .php would be appreciated of course. You might disagree with the above. Fellow app developers might also disagree with me on some points. But as I stated at the top: the post might contain some personal preferences and I might also be wrong about some points. If so then please let me know in the comments. 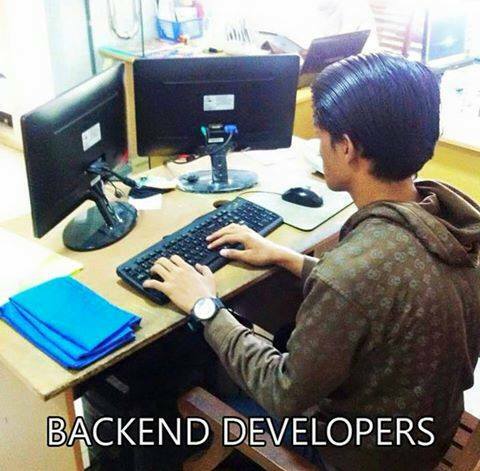 And I hope this helps to close the misunderstanding between backenders and app developers. Split v2.0 – Going Online Split!